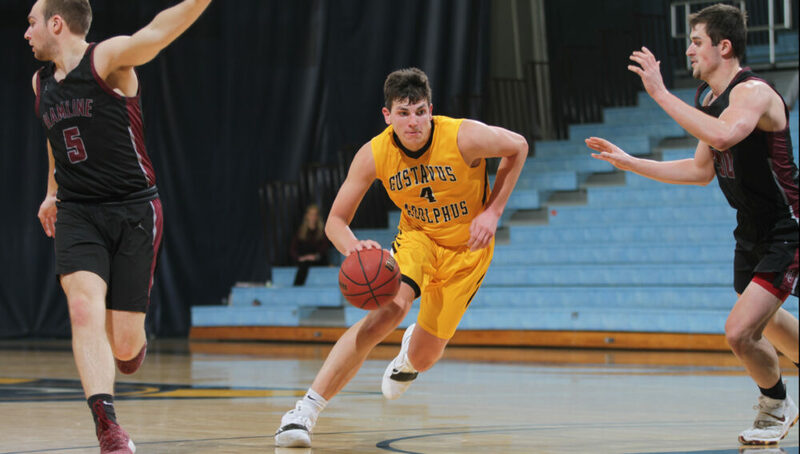 SAINT PETER, Minn. – The Gustavus men’s basketball team was able to handle a three-point barrage in the first half by Hamline to secure an 80-72 victory. With the win the Gusties move to 9-11 overall and 6-9 in MIAC play while the Pipers fall to 9-11 overall and 6-9 in league play. After the Pipers got out to a 9-2 lead to start the game Gustavus starting chipping away. They were able to cut the lead to one at 16-15 after Marten Morem (Fy., Caledonia, Minn.) knocked down a three at the 13:20 mark. The two teams traded baskets until the Pipers knocked down a three to take a 25-24 lead. Gustavus then went on a big 13-2 run to take command of the first half with a 37-27 lead. The Pipers answered the call knocking down three pointers on consecutive possessions but the Gusties battled back and were able to hold a 48-38 lead at the half. In the first half of action the teams combined for 16 three-pointers with the Pipers going 9-13 and the Gusties going 7-13. Gustavus won the rebound battle 15-7 in the half and also had 16 assists to just six from Hamline. Nolan Malo (Fy., Owatonna, Minn.) led all scorers with 14 first half points on 5-9 shooting. After just six total fouls were called in the first half the game slowed down in the second as there were 25 combined fouls called. The two teams traded buckets early in the half and a Logan Rezac (So., Andover, Minn.) jumper in the paint gave the Gusties a 55-44 lead with 16:09 to play. The Pipers went on a 10-0 run though thanks to a three-pointer, a layup, and five free throws to cut the Black and Gold’s lead to one. A few minutes later another Rezac basket in the paint would start an 11-4 run for Gustavus to give them an eight-point lead before a pair of Piper free throws cut the lead to six at the 11:19 mark. Both teams hit cold spells though as not another basket was scored until Spencer Tollefson (Sr., New Richland, Minn.) tallied two of his 10 points on a mid-ranger jumper at the 7:44 mark. The Pipers battled back to cut the lead to three twice late but the Gusties got stops in the last 5:09 allowing just four points to gut out an 80-72 victory. Malo led all scorers in the contest with 21 to go along with five rebounds. Rezac came off the bench to give the Gusties 14 points and a team-high seven rebounds. Riley Sharbono (Sr., Marshall, Minn.) and Isaac Douglas (So., Montevideo, Minn.) dished out six and five assists respectively for the Black and Gold. The Gusties will next be in action on Saturday when they host Carleton for a 3 p.m. contest.